Most supporters had already successfully predicted the line-up Kenny Jackett would roll out for that afternoon’s game. The Blues boss had found a settled side that was not just delivering results but storming their way towards the Championship. Jackett would only switch things around when injuries intervened or players were unavailable because of suspension. At the turn of the year, Pompey had a five-point lead at the summit of the table. At one stage, Jackett’s rearguard bragged the best defensive record in the league. Their ability to stoically soak up pressure was the cornerstone to success. In central midfield, Tom Naylor and Ben Thompson formed a formidable partnership. And the attacking quartet of Jamal Lowe, Ronan Curtis, Gareth Evans and Oli Hawkins tormented almost anyone in their path. January couldn’t have come at a worse time for Jackett, however, and Pompey have failed to win any of their five league games since the 2-1 success against AFC Wimbledon on New Year’s Day. All four loanees – Thompson (Millwall), Andre Green (Aston Villa), David Wheeler (QPR) and Joe Mason (Wolves) – returned to their parent clubs. That meant fresh faces needed to be recruited and then given time to acclimatise. Niggling injuries to Andy Cannon (quad) and Bryn Morris (ankle) have restricted their playing time since arriving from Rochdale and Shrewsbury respectively. The Fratton faithful have also yet to get a glimpse of Barnsley loanee Lloyd Isgrove (knee), while on-loan Cardiff striker Omar Bogle limping off with cramp at Plymouth on Saturday suggests he might be slightly short of match fitness. Meanwhile, Viv Solomon-Otabor and James Vaughan – joining on temporary deals for the remainder of the campaign from Birmingham and Wigan respectively – were unused substitutes at Home Park. Nevertheless, Jackett feels when the six new faces are all up to speed then it will give him good options for the period of five games in 15 days he sees as somewhat season-defining. 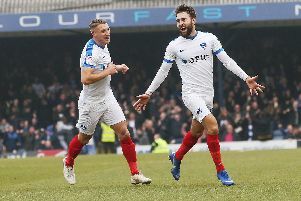 The Pompey manager may still regard the team he stuck with during the opening half of the campaign – obviously, with the exception of Ben Thompson – as his strongest. They underlined they are capable of mounting an automatic promotion charge. But going five games without a league win and losing further ground on the top two at Argyle – coupled with the manager’s comments after the recent 1-1 draw – suggests Jackett might be prepared to change. The back five of Craig MacGillivray, Nathan Thompson, Christian Burgess, Matt Clarke and Lee Brown almost picks itself. But the void of Ben Thompson is still to be filled in the engine room. Ben Close, Morris, Cannon, Dion Donohue and Adam May are all tussling to become Naylor’s new partner-in-crime. Meanwhile, Jackett purposely bolstered his forward options to ensure the goals don’t dry up or the spark goes out for the business end of the campaign. Pompey haven’t had the same prowess in the final third in recent matches. Curtis and Lowe have made nowhere near the same impact, and a break may be needed to top up their energy levels. Solomon-Otabor and Isgrove wait patiently in the wings and will feel they can reignite the Blues’ promotion charge. The battle for the sole striker spot in Jackett’s 4-2-3-1 formation is also an intriguing one, with Hawkins, Bogle, Vaughan and Pitman fighting it out. So as the January arrivals start to reach full fitness, it means the stakes have been raised. Standards should hopefully be raised, both in training and on a match day, and starting berths may no longer be guaranteed.